BUFFALO, N.Y. — Akashi Therapeutics Inc., a clinical-stage biopharmaceutical company, has acquired the rights to a drug that University at Buffalo scientists have begun developing for Duchenne muscular dystrophy, a fatal genetic disease affecting young boys. The potential therapy is called AT-300. It is a modified form of a small protein UB researchers first discovered in the venom of the Chilean rose tarantula. AT-300 promises to slow the muscle deterioration that characterizes muscular dystrophy. In patients with dystrophy, genetic mutations weaken the membrane of muscle cells, enabling large amounts of calcium to infiltrate the cells. This sets off a chain reaction that leads to muscle degeneration. AT-300 has been shown, in laboratory studies, to stop the dangerous calcium influx by keeping pores called mechanosensitive ion channels shut when muscle cells are stretched, says UB scientist Frederick Sachs, who led the research. The protein also holds promise for preventing cardiac failure, one of the most common causes of death in dystrophic boys, he adds. Akashi Therapeutics will fund further development of AT-300. The company is licensing the rights to the protein from Tonus Therapeutics, a UB spinoff Sachs co-founded with colleagues and a Western New York stockbroker whose grandson has Duchenne muscular dystrophy. Akashi Therapeutics is sublicensing global intellectual property and commercialization rights for AT-300 from Tonus Therapeutics, which licenses the rights from UB. Tonus and UB will receive royalties on sales of any resulting Duchenne muscular dystrophy treatments. “This agreement is an important opportunity because Akashi Therapeutics has the funding and resources to propel development of this new potential drug,” says UB Vice Provost Robert J. Genco, PhD, DDS. Genco oversees UB’s Office of Science, Technology Transfer and Economic Outreach (STOR), which commercializes technologies developed at the university. Sachs, PhD, a professor of physiology and biophysics, will continue to help oversee research and development. 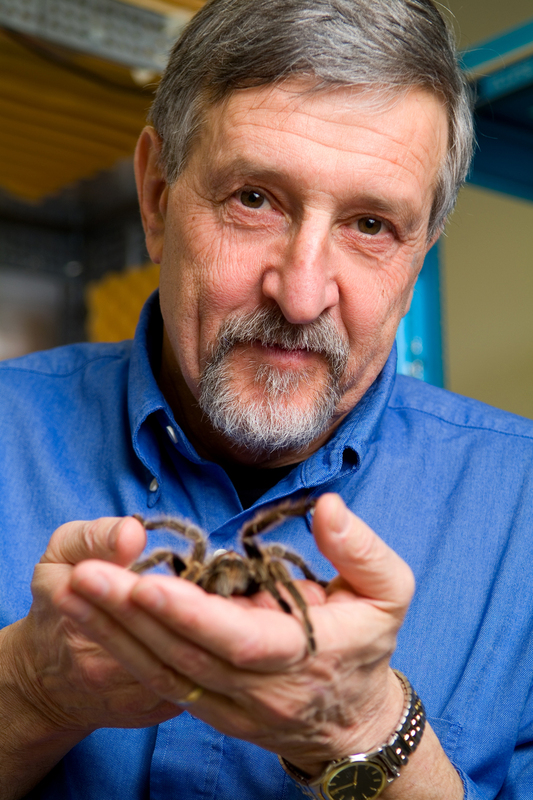 His team — including fellow Tonus co-founders Thomas Suchyna, PhD, and Philip Gottlieb, PhD — discovered the tarantula protein in the 1990s. Currently, the scientists are studying AT-300’s effectiveness on dystrophic mice. They expect to finish this research in 2015, and the next step after that will be preparing to apply to the U.S. Food and Drug Administration for approval to conduct human clinical trials. AT-300, as it is currently used, is a laboratory-synthesized, mirror image of the original tarantula protein, which was called GsMTx-4. AT-300 is designed to remain stable for a long time in the human body. Information on AT-300 is available at http://akashirx.com/pipeline/. Akashi and Tonus are natural partners: two companies founded to treat rare pediatric diseases. Akashi, launched by leading patient organizations and biotechnology industry veterans, is developing a cocktail of medications with the goal of transforming Duchenne muscular dystrophy from an aggressive, 100-percent fatal disease to a chronic, manageable condition. Tonus’ founders include Jeff Harvey, a retired Buffalo-area stockbroker whose grandson, JB, has Duchenne muscular dystrophy. Now a bright-eyed 7-year-old, JB lives near Boston, Mass. He loves Legos and Star Wars. He likes football and, through a charity called Team IMPACT, has been “adopted” by the Boston College football team, whose members take him trick-or-treating and invite him to games and practices. But while he’s full of smiles, JB has trouble climbing stairs. Even walking is becoming difficult, Harvey says. “Oh, I would be thrilled if you could be a baseball player,” Harvey remembers replying. He hopes AT-300 can help JB — and other boys like him — live out their dreams. Currently, children with Duchenne muscular dystrophy have very limited treatment options. Many are in wheelchairs by the time they’re 12, and few survive beyond their 30s. “AT-300 has the potential to be a critical component of the cocktail of therapies that will help achieve our goal of transforming Duchenne muscular dystrophy into a chronic, manageable condition,” said Marc B. Blaustein, Akashi CEO.